Facts about Potter Wasps, "Scientific name for Potter Wasp is Eumeninae", they are also known as mason wasps and were once in their own family of Eumidae. In recent times they are identified in the subfamily of Vispadae and the genus of Eumenes. This does not mean that they are not considered to be among the Eumidae family. The Potter Wasp are still identified in this family. The Potter Wasp are found in black or brown color and marked with contrasting patterns of orange, white, yellow or red. Sometimes these colors are combined and there are other species especially from the tropical regions that shows a background of blue or green. The Potter Wasp are known to be medium to large sized wasps. The Potter Wasp can grow up to 20 mm long. The Potter Wasp have some characteristics that identify them. Their posterolateral projection is on both sides of the mesoscutum, the Potter Wasp have tarsal claws cleft and have fore wings with three sub-marginal cells. The Potter Wasp build their nests which are pot shaped and made of mud in some species. The females are responsible for making the nests. The Potter Wasp are very diverse when it comes to this because they use the already available resources. The nests in the ground, nail holes, hollow plant stalks or even the deserted bee and wasps nests. The Potter Wasp nests have linear of brood cells which have a mud partition. Most species construct nests that are pot shaped or jug shaped with narrow necks. 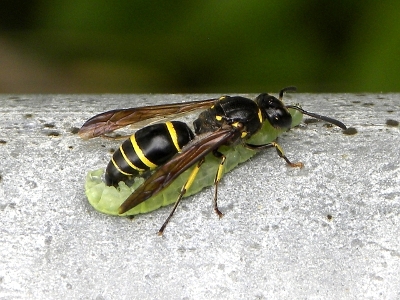 The Potter Wasp fasten the bottom of the nests with twigs. The nests are built independently where each female Potter Wasp makes her own nest which contains more cells. She carries water to a dry clay or soil and mixes it using her mandibles. Then her saliva is used to strengthen the dried mud. After that, she collects wood fibers to cover the mud nest. This building of nest is seen in most wasps especially these Potter Wasps. It is something that is very puzzling and scientist have pointed out that it is very unique compared to that of building nests with paper as seen in other species of wasps. After the nests are complete the female collects beetle larvae and caterpillars. The female Potter Wasp places them on the cell to serve as food for the larvae. The Potter Wasp have similar hunting tricks just like other wasps. They paralyze the caterpillars and spiders or any other prey by stinging then dragging them to their nests. Later the female Potter Wasp lays a single egg in that cell. The egg hatches and the larvae feed on the already piled food in the brood cell. The adult Potter Wasp eats its way up from the cell by chewing a hole on the thin side of that cell. It actually does not get out of the cell using its neck as many would have expected. The part of the neck is the thickest on nest. The Adults Potter Wasp feed on flower nectar. The female Potter Wasp do not defend their nests and are not aggressive. Though when disturbed they sting, but are loved by many gardeners. In fact in general Potter Wasps are considered to be an asset since they help in controlling caterpillars in the environment. In their subfamily Potter Wasps are the most diverse. The Potter Wasp are more than 200 genera and more than 3200 species in their family which contain 4500 species.